I’ve sure done a lot of research over the years on this topic. Plus, my book goes into a lot of depth about every vitamin, mineral and trace element your body needs to stay healthy. This title also includes the recommended dietary intake of each, and what happens if you have too little (or too much). Furthermore, my book also lists the best natural sources and what effects their uptake by the body. But the truth is, it’s difficult to comprehend holistically, and even if you can make sense of the complex web of vitamin-mineral relationships it’s a lot to put into practice. You know the warning, ‘that dietary supplements may only be of benefit if your dietary intake is insufficient or lacking’. But there is more to the jigsaw puzzle of nutritional supplements than meets the eye. Manufacturers are well aware that this complex topic can yield them big bucks. In fact, the global dietary supplements market is expected to reach USD 278.02 billion by 2024, according to a recent report by Grand View Research, Inc. So with everyone trying to grab their piece of this health-driven pie you can understand why companies are spending huge wads of cash to tell you why you need their product, and why theirs is better than their competitor’s. Think about it. How many times have you grabbed a paracetamol or aspirin to treat a headache? An anti-inflammatory to deal with a body ache? When have you instead aimed to decipher and address the cause, rather than the symptom? Life has sped up; it throws us daily curve balls, pumping our bodies with adrenaline to which we use a cocktail of substances, including coffee and alcohol, to manage our daily highs and lows. We’re on the road to somewhere, but it’s not the utopia of health and longevity we’re all hoping for. Almost each new study that comes out shows we’re getting sicker. We might be living longer than our ancestors, but not healthier. Our bodies are massively deficient; lacking in nutrients but more importantly lacking in water. We are chronically dehydrated and malnourished. The food that’s grown for us by big conglomerates clamouring for profit in a competition rich environment where genetic modification and low-cost-high-yield growth techniques are designed to produce the cheapest prettiest products. Subsequently, our fruit and vegetables are now only half as nutritious as they were 100 years ago. And as a bonus, they are jam packed with an array of toxins to prevent pests and blemishes. Toxins that our bodies just aren’t designed to handle. Further with the ever expanding waistline of fast food and manufactured snacks (the processing of which destroys almost all nutritional value in food), we’re now eating as little as 8% of the fresh produce that our parents ate. Our convenient ‘big gulp’ drinks and soy lattes are packed with sodium, sugars, colours, caffeine and flavours in insurmountable quantities, and we’re drinking less water than ever before. Who do you know that drinks half a gallon or 2 litres of water a day? And even that amount is grossly insufficient for the average person. It’s no wonder we’re all dying of ‘lifestyle’ diseases. Eat a diet of 70% whole fresh fruit and vegetables. Keep them as raw as possible. Thoroughly wash your produce before consuming, or better still, buy organic where possible to reduce the amount of toxins your body ingests. Get yourself tested to check your vitamin levels, or purchase a Vitastiq and test them yourself. Avoid all processed food (anything that can sit on a shelf unrefrigerated for days, weeks or months, or any ingredient you can’t pronounce). Reduce your caffeine and alcohol intake to one shot or two standard drinks a day. Eliminate all added sugars, simple carbohydrates and unhealthy fats. Drink 45mls of water per kilogram (0.7floz per pound) of body weight, per day, as a minimum. If after doing that for 2 weeks, if you still feel like you need a supplement then start taking a natural super greens supplement made from dehydrated and powdered fruit and vegetables. The most you should need above that is a good quality multi-vitamin from a GMP Certified manufacturer – remember it’s quality, not quantity. Food is medicine – millennia of evolution have designed our bodies that way. In fact, there’s a growing amount of evidence, including one recent study led by Dr David Suskind published in the December 2016 Journal of Clinical Gastroenterology, that a change in diet alone can cure many ailments and diseases, including Crohn’s. While a change in diet will work for the majority, some natural herbal supplements are suitable for specific conditions (especially hormone-related conditions and detoxification). And it’s best to see a qualified Naturopath or Herbalist to ensure you get the right compounds in their most natural state, and in the right quantities for your particular circumstances. Remember, everyone’s ‘body’ is different and responds to different treatments and diets. So if you think you need a supplement because of some advert, a friend told you, or it just seemed like a good idea, then think again. Get back to basics and give your body all it needs, naturally. Sigrid de Castella is an internationally published author, speaker, and coach in the fields of health and business. 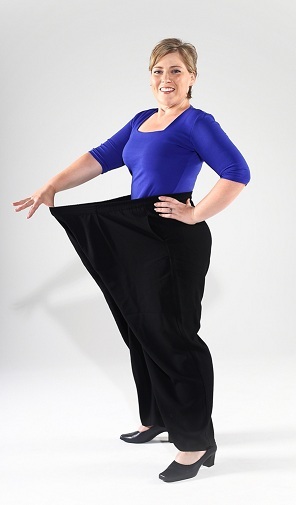 Her book “Half The Woman I Was – How I lost 70kg naturally, reclaimed my life … and how you can too!” has received international acclaim and has been hailed as the most comprehensive weight loss book on the market. Sigrid has also studied Personal Training with the Fitness Institute Australia and has a keen interest in whole food nutrition, natural therapies and all aspects of physical and mental health. Sigrid and holds a BBA from RMIT University and is a member of both the Australian Institute of Managers and the Australian Society of Authors. Want to Know More About Sigrid’s Book “Half the Woman I Was”? Then Don’t Hesitate to Watch this Video.